Food stamp usage in D.C. actually went up last year, despite census estimates to the contrary, The District’s Dime reports. According to the U.S. Department of Agriculture, 17 percent more households received food stamps in 2010 than in 2009. In 2008, the food stamp program was renamed as the Supplemental Nutrition Assistance Program, or SNAP. Check out DCentric’s primer on food assistance programs which delineates who qualifies for what programs and what they provide. 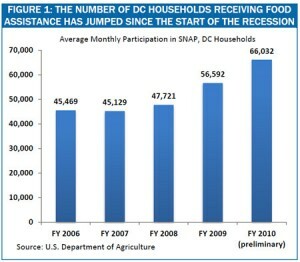 USDA figures show a 17 percent increase in the number of DC households receiving food stamps from 2009 to 2010, not a decrease. It shouldn’t be much of a surprise that the number of families in DC seeking help from the food stamp program has risen in the last few years. Both unemployment and poverty have worsened in DC over the last few years, making it harder for families to make ends meet and take care of their basic needs.